Today I want to present the Expansion Breakout setup by Jeff Cooper, published in his book “Hit and Run Trading”. Cooper describes in his book that when trading breakouts he often found himself on the wrong side of the trade. Therefore he took a closer look at the winning trades and noticed that a winning breakout trade was often accompanied by a daily trading range that was the largest of the last nine days. To make use of this finding he created the following setup. 1.) Today’s close must be a 50-day high (in the original text it is “a two-month calendar high”; since a calendar month has about 25 trading days I translated this to a 50 day high to make it programmable). 2.) Today’s trading range must be equal or larger then the largest daily range of the previous 9 trading days. 4.) 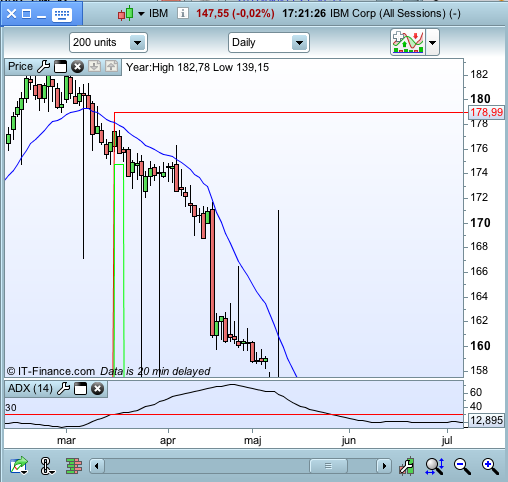 Initial maximum risk (stop loss) is 1 pip under yesterday’s close. 1.) Today’s close must be a 50-day low. 3.) 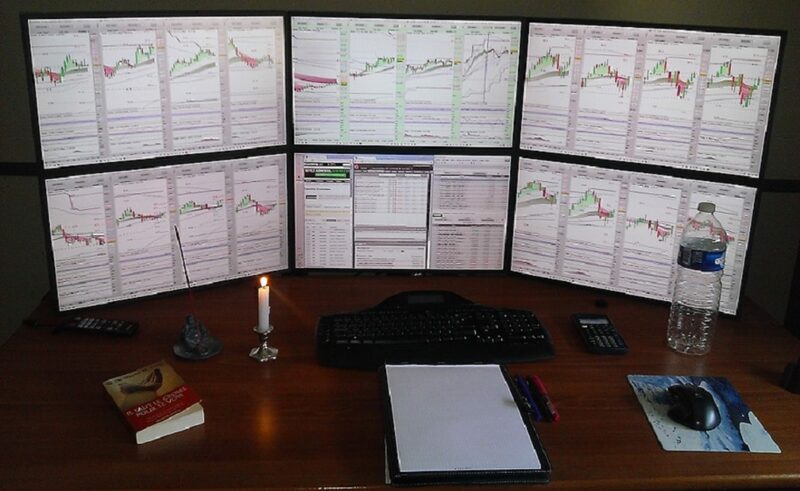 On the following day only, sell short 1 pip below today’s low. 4.) Initial maximum risk (stop loss) is 1 pip over yesterday’s close. We got several hits. The screener is not differentiating between long and short signals, I chose instead to show how many days have past since the signal was given (PRT only allows to show one criterium). 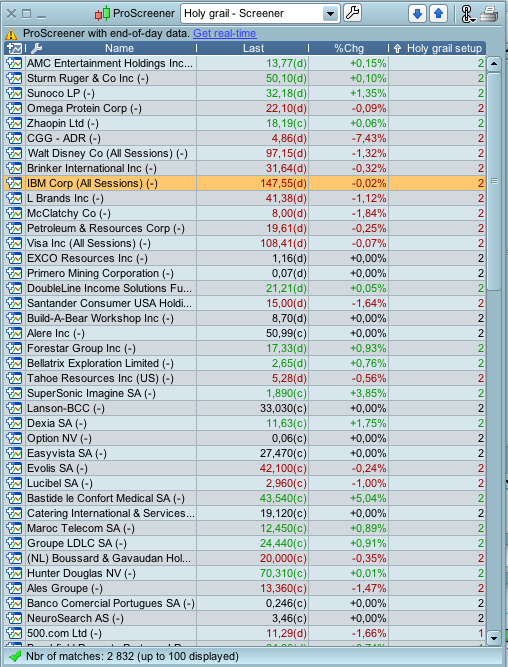 As example for a long setup I chose Ally financials. You see a chart right below. 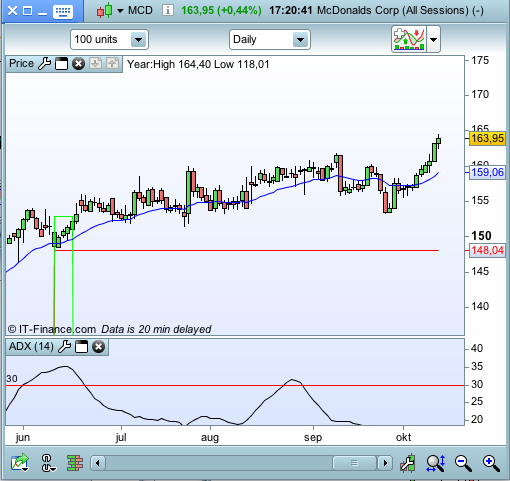 On 29th September a Expansion Breakout for a longsetup is forming. The indicator draws a green arrow below the break out candle. 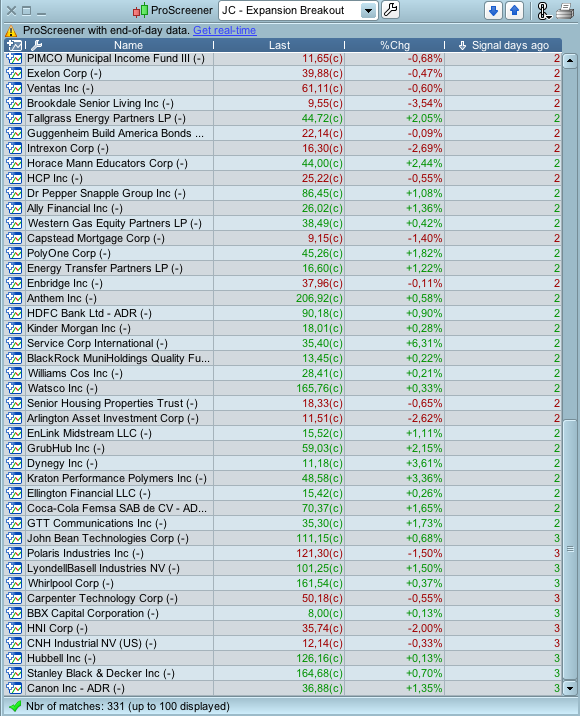 It also gives the entry level for the next day (green line) and the stop loss (red line). On October 2nd (the next trading day) the close penetrates the green line and we are long. 8 days later price retests the region of our entry but prices do not close below our stop loss. At October 25th another break out candle is forming and makes the trade profitable. It is not unusual for this setup that in a strong trend several breakouts follow each other in the direction of the trend. Usually the first breakout of a new trend gives the best results. Let’s look at a second example. 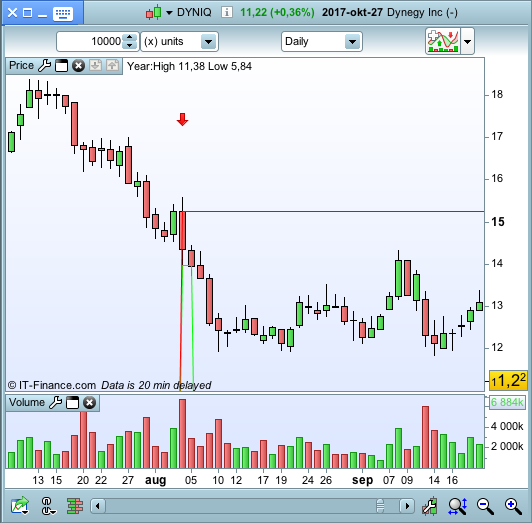 This time we are looking at Dynegy Inc.
On August 4th a short setup is forming. The indicator draws a read arrow above the breakout candle. Besides it gives us the entry for the next day (green line) and the stop loss for the trade (red line). The following day price closes below the green entry line and we are short.